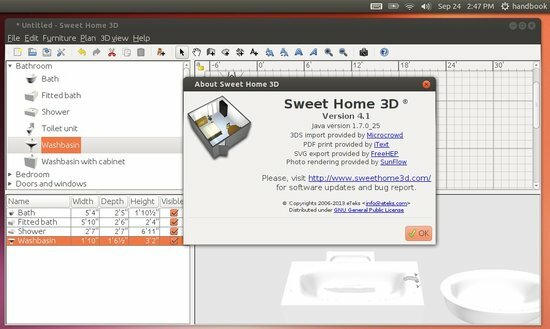 This tutorial shows how to install the latest Sweet Home 3D 4.1 in Ubuntu 13.04 Raring, Ubuntu 12.04 Precise and Linux Mint 13 Maya, 15 Olivia via PPA. Fixed a printing bug that didn’t always show the expected pages. Updated the Online version to ensure it won’t display an additional security warning when run with latest Java version. 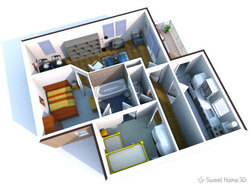 Added com.eteks.sweethome3d.swing.fixedPrintMargin system property to be able to force a print margin (expressed in centimeters) when customized margins entered in page format dialog box aren’t taken into account. Fixed a bug that kept displaying the available updates of a library even once it wasinstalled. While the default version in Ubuntu 13.04 and Ubuntu 12.04 are 3.7 and 3.4, the latest now is available in GetDeb repository. For Linux Mint users, see this post to enable getdeb repository. This version doesn’t work under Ubuntu 13.04. Run it and try to open Preferences. It will crash.